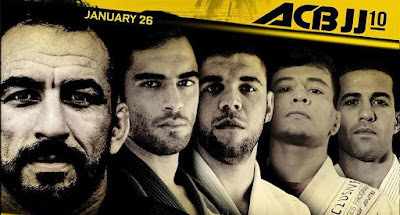 Jiu-jitsu.News: ACB 10 is Ready to Roll! Today is the day when arguably the greatest professional jiu-jitsu event ever assembled. We are talking about the ACB Jiu-Jitsu 10, held in Sao Paulo – Brazil. With over 20 World titles on the mats at the event the ACB JJ 10 card will feature an all-star cast with every single match being worthy of headlining any high end grappling show on earth today. The ever growing pro jiu-jitsu show has a unique rule-set based on the mixed martial arts (MMA) point system: each match is decided in 3 rounds of 5 minutes, no guard pulling allowed in the first minute. Each round is judged independently and scored as 10-9, or 10-8 depending on the point differential during that round. Submissions end the match, much like they would in an MMA match. Among the participants there are a lot of BJJ stars such as Lucas Rocha, Osvaldo Moizihno, Josh Hinger, Yuri Simoes, Romulo Barral, Erberth Santos, Leandro Lo, Marcus Almeida, Paulo Miyao, Joao Rocha and many others.